We make our home in California, where I have an urban kitchen garden that provides most of our fresh veggies. We also have a vacation place in Rhode Island that has large and prolific blueberry bushes. My last summer's visit to Rhode Island was perfectly timed to the blueberry season - yay! Fresh off the bush blueberries are pretty amazing, just ask the birds that flock around for the extras. Of course, I had to capture all this freshness to bring back to California. Everyone spends their vacation making jam - right? Well, gathering blueberries and preserving them in my farmhouse kitchen is my happy place. I take over our long kitchen table with blueberries and canning jars, throw open all the windows and stand at the stove looking at my favorite ocean view. Just thinking about making jam in our Rhode Island kitchen makes me relax and smile - I can almost smell the fresh flowers we always have on the table. Last summer I was able to make enough jam to share with some Rhody neighbors and bring the rest to California with us. So, here we are in California, with the berry season in high gear and I have a couple jars of that blueberry jam on the shelf. Time to put it to good use and clear the shelves for this season's preserves. I make a simple cake with stirred in fresh berries and a ribbon of that yummy blueberry jam. Super easy and perfect for breakfast or dessert. In my California garden, I have strawberries. We get them in dribs and dabs since it is their first year planted. To make up the slack I stopped by our local farmer's market and picked up some blueberries and blackberries. I have a favorite vendor and she always saves some less than perfect berries for me to use in cooking and jamming. I was not disappointed as she had 2 big bags of berries waiting for me. So this batch of mixed berry cake has strawberries, blueberries and blackberries topped with homemade blueberry jam from Rhode Island. While this combination is awesome, the recipe works for any mix of berries and jam you happen to have. If you don't have homemade jam - no worries! Store bought jam will taste just fine. 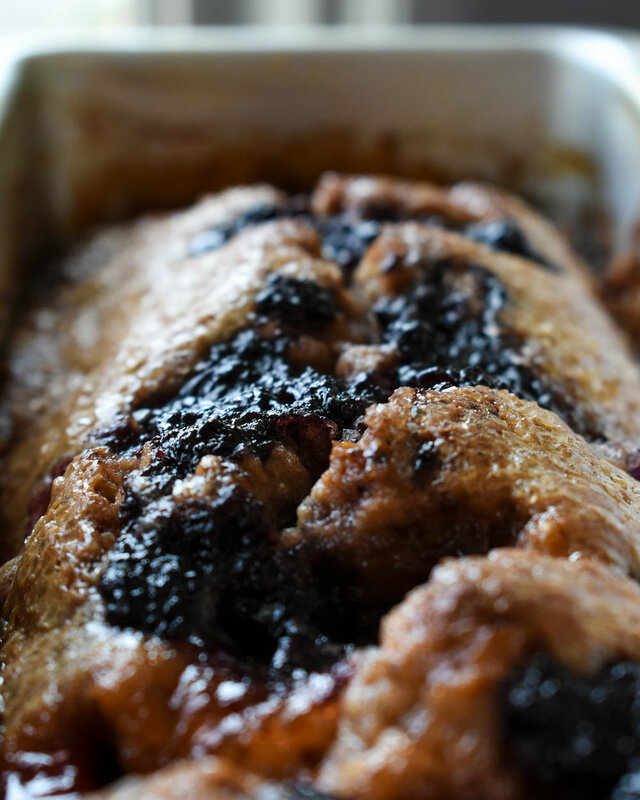 We enjoy the mixed berry loaf cake for breakfast and snacking on the weekends. It makes a fresh spring dessert too - especially when topped with a scoop of ice cream or a dollop of whipped cream. Preheat oven to 350 degrees. Prepare a loaf (9"x5") pan with butter and a dusting of flour. Whisk flour, baking powder, baking soda, spices and salt in a small bowl. In a separate bowl, whisk eggs and brown sugar until frothy. Whisk in oil, buttermilk, vanilla and lemon zest. Stir dry ingredients into the wet. When combined, mix in the chopped berries. Pour batter into prepared loaf pan and spoon jam onto center of the top. Use a knife to swirl the jam into the batter. Bake for about 1 hour until tester comes out clean. Cool on wire rack. Eat for right out off the rack for breakfast or serve warm with ice cream or whipped cream for dessert. NOTE: Don't be afraid to get creative with your berry and jam combinations - they all work. Use what you have as the recipe is infinitely adaptable.